People were packed into two rooms in the C Building when LiU staff met newly arrived people looking for traineeships. Clinicum, in the Faculty of Medicine and Health Sciences, is one of the units at LiU interested in receiving trainees. “For us, it goes without saying that we should help to create opportunities for newly arrived people to gain insight into the Swedish labour market,” says Anne-Christine Persson, manager at Clinicum. “I think it’s a great benefit simply to get involved. I’ve lived abroad myself, and I know how difficult it can be to find your feet in a new culture,” says Christina Bendrik, coordinator at Clinicum. Veronica Brodén Gyberg, coordinator for LiU’s initiatives in refugee issues, together with Arbetsförmedlingen (Sweden’s Public Employment Agency) and “Korta vägen” (a labour market training programme for university-educated people new to Sweden) arranged the meeting between LiU staff and potential trainees. The background to the meeting was the initiative taken by the Swedish government, asking agencies and other bodies to provide traineeships for newly arrived people during a three-year period. 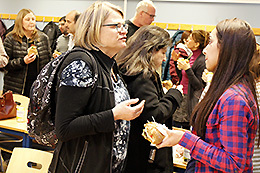 Between 40 and 50 newly arrived people, all of whom had at least completed upper secondary education, came to Campus Valla to meet around 15 staff members. Both Anne-Christine Persson and Christina Bendrik agree that it’s obvious that the university must get involved in this way. Christina Bendrik met Ghassan Jarjour, who has previously worked in a laboratory and is interested in a traineeship in this field. And Anne-Christine Persson started to talk with Raghda Abou Asali, a qualified lawyer from Syria, who is now interested in a traineeship in administration. She has been in Sweden for eighteen months and has taken courses in Swedish designed for immigrants. Now she wants to enter the labour market. Just two of many meetings that may lead to a traineeship.